Palau has a rich heritage of conservation that has evolved from the traditional moratoria on fishing, or “bul”, to more western Marine Protected Areas (MPAs), while still retaining elements of customary management and tenure. In 2003, the Palau Protected Areas Network (PAN) was created to conserve Palau’s unique biodiversity and culture, and is the country’s mechanism for achieving the goals of the Micronesia Challenge (MC), an initiative to conserve 30% of near-shore marine resources within the region by 2020. 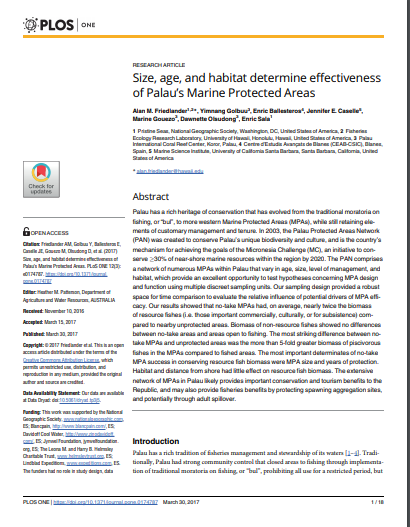 The PAN comprises a network of numerous MPAs within Palau that vary in age, size, level of management, and habitat, which provide an excellent opportunity to test hypotheses concerning MPA design and function using multiple discreet sampling units. Our sampling design provided a robust space for time comparison to evaluate the relative influence of potential drivers of MPA efficacy. Our results showed that no-take MPAs had, on average, nearly twice the biomass of resource fishes (i.e. those important commercially, culturally, or for subsistence) compared to nearby unprotected areas. Biomass of non-resource fishes showed no differences between no-take areas and areas open to fishing. The most striking difference between notake MPAs and unprotected areas was the more than 5-fold greater biomass of piscivorous fishes in the MPAs compared to fished areas. The most important determinates of no-take MPA success in conserving resource fish biomass were MPA size and years of protection. Habitat and distance from shore had little effect on resource fish biomass. The extensive network of MPAs in Palau likely provides important conservation and tourism benefits to the Republic, and may also provide fisheries benefits by protecting spawning aggregation sites, and potentially through adult spillover.